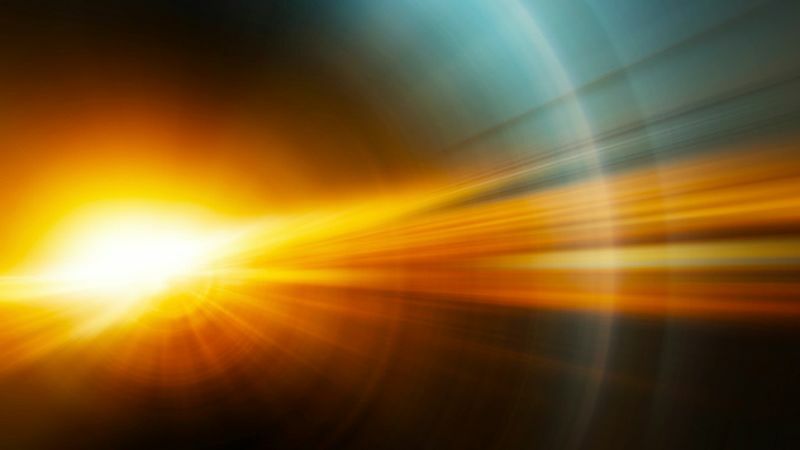 What would the universe be like if the speed of light were infinite? It might seem like a silly question, since the speed of light clearly isn’t infinite, but questions like these are a good way to explore how different aspects of a physical model are interrelated. For example, in our universe light is an electromagnetic wave. It not only has a speed, but a wavelength. If you think of a wave as an oscillation, then at infinite speed light would have no time to oscillate. So infinite light can’t be a wave. 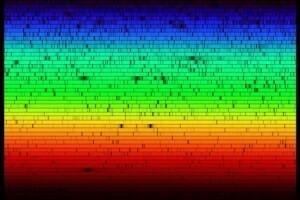 Since the wavelength of light determines its color, that would also mean it has no color. But it gets worse because in classical physics light is produced when electromagnetic waves cause the charges in atoms and molecules to oscillate. Without waves, atoms can’t be induced to emit light, the universe would be a sea of darkness. But real light actually has both wave and particle aspects, so let’s suppose that for infinite light it’s just some kind of particle so we can still have light and color without all that meddling wave business. What else would change? Relativity is an obvious choice. Einstein’s theory of relativity depends upon a finite speed of light. With an infinite light speed, all those fun things like time dilation are thrown out the window. So is Einstein’s most famous equation, E = mc2. The main consequence of this equation is that matter can be transformed into energy and vice versa. It’s central to things like nuclear fusion, which powers the stars and creates the heavy elements. Stars could still be powered by gravitational contraction, but they would only last for a million years rather than billions of years. They also wouldn’t have any mechanism to explode as supernovae, so there would be no way to make new stars from old ones. Since Einstein’s theory of gravity is a generalization of special relativity, it goes away too. Our model of the universe, beginning with a big bang and expanding through dark energy, depends upon Einstein’s theory. Without it the universe look very different. No dark energy, possibly no big bang. Of course this is all just a game of pretend. If you made different assumptions about physical phenomena you would derive different effects. We have no way of knowing what an infinite light speed universe would really be like. But what this shows is just how interconnected different aspects of a physical model actually are. Any tweak to the model has consequences that can ripple into widely different areas, or even cause an entire model to collapse. Good what-if read Dr. Koberlein. If there are no supernovae, would stars larger than 1.4 solar masses (i might have the number wrong) just collapse into a blackhole when they ran out of fuel? I’m a bit confused. You say that Einstein’s theory of relativity depends on the speed of light. So far so good. But then if we change light’s speed relativity gets all messed up? I was under the impression that Einstein used light’s speed in his equations only because that’s the most common thing that travels at the speed limit of the universe, not because relativity was connected to light per se. Am I correct? Because otherwise it makes it seem as if relativity hinges on the physical properties of photons, such as their speed. Which is a… weird thought. There is a sense of causality that is lost if there is no universal speed limit (of light and every other phenomenon). In our universe, if you know the distribution of matter and energy in a certain region at one point in time, you can predict with certainty what part of it will be like in a later time. Even taking quantum mechanics into account, it’s possible to predict probabilities for what will happen in the inside of the region. If there was no speed limit (like in Newtonian mechanics), it’s possible that an infinitely fast, or arbitrarily fast, rock is approaching your system and will hit it just after the specified initial conditions. There is no way to make even probabilistic predictions under these circumstances. The same goes for an infinitely fast beam of intense light, such as a gamma ray burst. One may even ask how this stronger form of causality wasn’t suggested before Einstein. P.S. In computer algorithms for cellular automata, this kind of guarantee of causality is used to parallelize computation and in other interesting ways. I don’t suppose our nifty GPS satellites would be able to do their jobs anymore, but hey, at least our online video games would no longer have network lag. I can’t help feeling a little claustrophobic at the idea of infinite light speed. Quote: “…Since the wavelength of light determines its color, that would also mean it has no color.” This is inaccurately. The wavelength doesn’t determine the color. The frequency (f) determines it. When the light goes through different media (air,water, glass, etc.) its wavelength changes, but its color doesn’t. The wavelength (L) changes at same rate as the speed (c), i.e. f=c/L remains unchanged. So just f determines the color. If we use quantum viewpoint the result is same. The energy of photons (E) determines our feeling of color. But E=h.f, i.e. again the f determines the color. If we know black holes can trap light. Then it must be that the gravity is stronger and controls light’s speed. What if that light approached that field with compliment Would this force not increase the photon as it crosses the event horizon? If light were about 2% less, there would be no carbon; if it were much faster, there would be no oxygen. I’d love to hear where you’re getting that from.